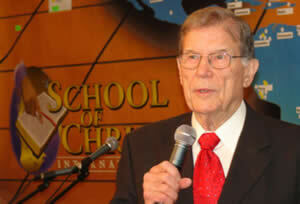 B. H. Clendennen has been an ordained minister of the Assemblies of God for fifty-five years. In November 1956, he came to Beaumont, Texas and started the Victory Temple Church. In December, 1991, he felt the call to be a full-time missionary in Russia. In 1992 the first School of Christ was born. Since that time the translating of the School of Christ material has been an ongoing project. In 1967 Brother Clendennen ministered five weeks in the bush country of Tanzania, East Africa. Many souls found Christ during that time. The need for church buildings was so great when Brother Clendennen returned to the U.S. he raised the money to build fifteen block and steel churches. In one year missionary Morris Plotts had the churches erected. In April 1968 Brother and Sister Clendennen returned to East Africa to minister and to dedicate the new churches. From East Africa the Clendennens went to Iran to minister and participate in the ground breaking for the first Bible School in thirteen hundred years to be built in that land. In December 1968 Brother and Sister Clendennen journeyed around the world preaching in Spain, France, Rome, India, Thailand, and Vietnam. In Southern India, above ten thousand people gathered to hear the Gospel, hundreds were saved and filled with the Holy Spirit. In Vietnam God opened the country to the Clendennens. From 1968 to 1975 when American forces pulled out, they were there most of the time. The work became such as to demand full time workers with the American serviceman alone. It was most successful. Under the ministry of the Clendennens Pentecost came to Vietnam for the first time. In 1971 the Clendennens were invited to Zaire (Congo) for a crusade. For twenty-one days God's power fell upon the crowds estimated by the police to be sixty-five thousand people. Every year after that Pastor has held at least one crusade in Zaire. In February 1980 Brother Clendennen was invited to minister in Yugoslavia, Hungry, and Romania. Every church Brother Clendennen ministered in was filled to overflowing and people were standing out in the freezing cold looking in the windows. In 1981 Brother Clendennen returned to Bulgaria and Romania to find the Spirit of the Lord still moving and the churches growing. Also in 1981 Brother Clendennen returned to hold a Crusade in Zaire, South Africa. There were thousands out every night to hear the Word of God. In December 1981 he returned to Zaire to hold a Preachers Conference for the native pastors. There was a real moving of the Holy Spirit and the pastors returned to their churches renewed in the Lord. Every year since then Brother Clendennen has returned to hold the ministers seminar. This seminar includes the ministers and their wives, plus all of their food and lodging for the week. This is totally funded by Brother Clendennen himself. This has become a time of real Spiritual growth and development for these ministers. The School of Christ is comprised of 151 lessons divided up into 19 series. These series cover many aspects that are not covered in a seminary. The School of Christ is not meant to replace long term Bible schools or seminaries. The School of Christ is God's answer to those men and women who are called of God, and do not have the time or means to attend the seminary. It is designed to equip men and women to carry the Gospel intelligently to every region of the world. We believe that the church comes out of life, not doctrine or orthodoxy or by human effort and resource. If the student can become full of the life of God, then wherever he or she goes in the will of God, a church will be born. The School of Christ is a body of teaching that has come about through God's direct dealings with His chosen vessel, Brother B.H. Clendennen. Everything placed in the manual has come out of life, that the life of God might be communicated to every student of the school. Every passage is just as alive as when God birthed in the heart of the man of God, and will remain that way just as Brother Clendennen is today in the presence of Jesus.